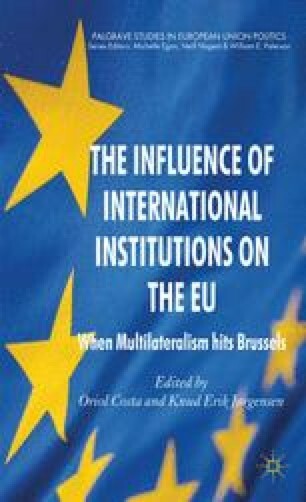 During the last two decades, the European Union (EU) has not only developed an ever more comprehensive acquis in many policy areas, but has also engaged in extending these rules to non-EU members through ‘governance below the membership line’ (Friis and Murphy, 1999) or ‘external governance’ (Lavenex, 2004). In the realm of environmental policy, for instance, the EU has been promoting its rules, including those of environmental governance, in its neighbourhood for many years. In its efforts, the EU has not relied on bilateral approaches only but has also made use of multilateral fora in order to transmit its environmental acquis. One of these is the so called ‘Environment for Europe’ (EfE) process that emerged from a Czechoslovakian initiative in 1991. The achievement of greater policy co-ordination was among the major objectives of this process from the beginning. However, it was clear that policy co-ordination meant ‘one-way harmonization’ towards EU rules (Caddy, 1997).